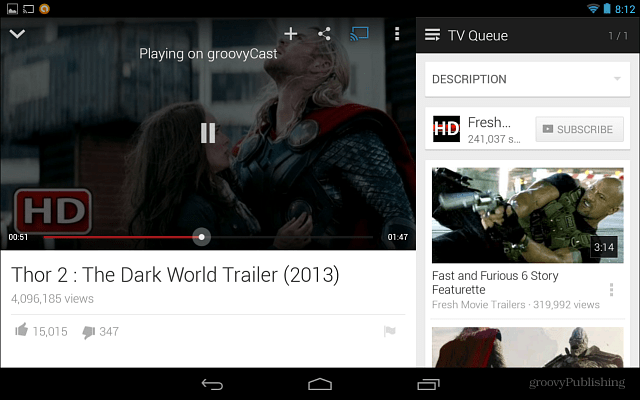 Google Chromecast is designed to provide internet streaming content. 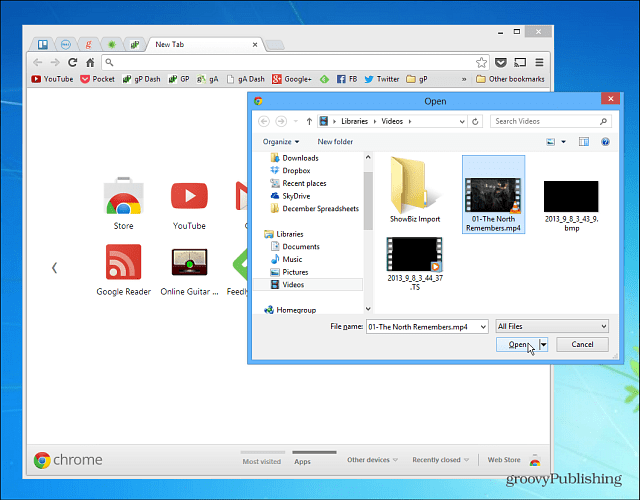 It’s not necessarily meant to stream local files, but you can with the Chrome browser. The latest rage for home entertainment systems is Google’s $35 Chromecast. The company hopes it will be the new living room entertainment device of the future. One thing it’s not designed to do is stream local media. But with an extension and a little know-how, you can stream your local files to it. Out of the box, the Chromecast allows you to send YouTube, Netflix, and music, TV, and movies from Google Play. Compared to the Roku, Apple TV, or Xbox 360, it currently doesn’t have much to offer. But here are some ways to get more content to your HDTV via the Chromecast. After you set up Chromecast on your Android device you’ll have the option to download apps that allow you send content to Chromecast. 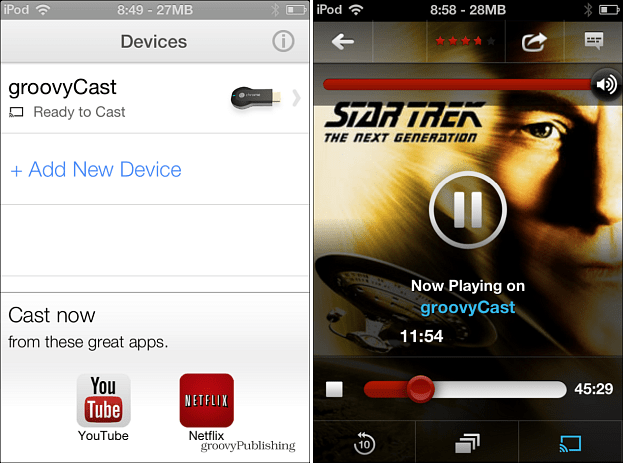 Install the Google Cast extension in your Chrome browser. Then start playing the video or music file you want to stream in the browser. Yes! You can play media file types directly in Chrome. There’s a couple of ways to do it actually. Either drag and drop the file into the address bar. Or open a new tab in Chrome and hit Ctrl + O (or Command + O on a Mac) and browse to the media file you want to play. In my tests, I’ve been able to play MPEG, MPG, MP4, M4V, OGG, MP3, and AVI files. I tested several MKV files, and the video would stream, but without sound. No love for FLAC files either. If the media plays in the Chrome browser, click the Google Cast button and send it to your HDTV. 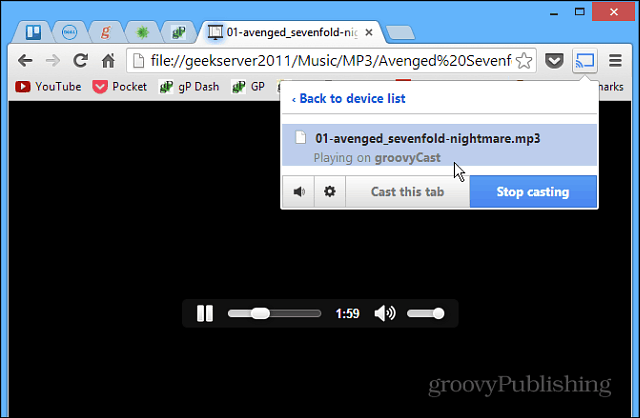 Here’s an example of streaming an MP3 file. 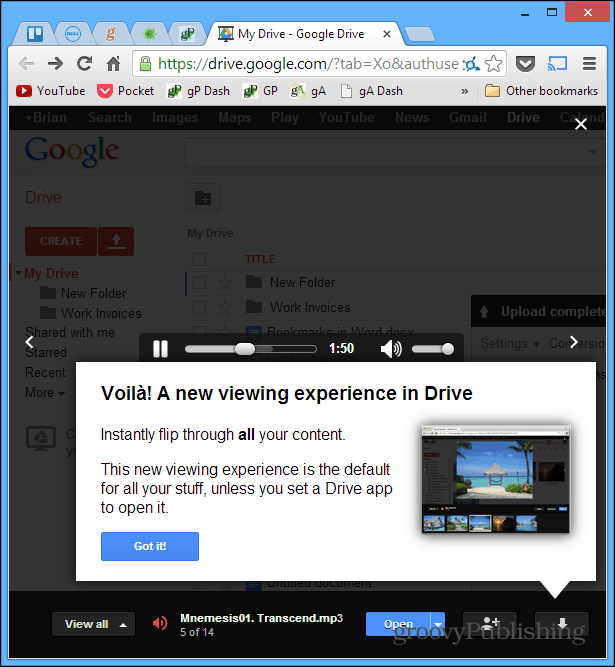 You can even stream compatible media files from Google Drive. The quality of the stream will depend on the state of your WiFi router and amount of traffic on the network. If you’re having streaming problems, change the options to a lower quality setting. Or, if things are streaming well, you can increase the quality – up to 720p only though. You’ll also want to make the video display in full-screen mode so it shows larger on your HDTV. Otherwise, it displays in at a smaller aspect ratio which isn’t that ideal for viewing. Then hit Esc to exit full screen. In this example, I’m streaming a video from my home server which is cool that you can stream from network locations too. 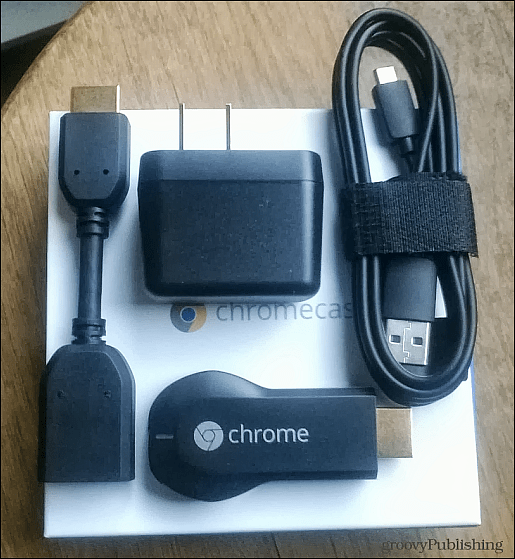 A few more things to note about the Chromecast. While all the images of it give the impression you just plug in the stick into an HDMI port on your TV, you also have to connect it to a power source. It comes with the power cord that connects to it. This is kind of annoying in my opinion but doesn’t necessarily make it a deal breaker. I was considering giving the device a mediocre review until I discovered this workaround for streaming local media. In fact, a lot of the media I tested for this article I streamed directly from my Windows Home Server. It’s also worth noting that there’s an app for your iPhone or iPad and it seems to work as advertised. Still, there is a lot of room for improvement with this new device. If you already have a Roku or Apple TV that you use as your set-top box, there’s not much of a reason to get the Chromecast unless you’re like me, a cord cutter, and want another toy to watch videos and listen to music. Are you using a Chromecast? Leave a comment below and let us know what you think about it. Did you try and right click the video file and play the video file on google chrome then cast it? Sorry Jun, I think I may have missed a step. Did you suggest that I right click and play to Chrome? Is that in the ‘open with’ options? I can’t see how I can do that. @Diablo: that actually happened to me a couple of times, but only when I was trying to play files that aren’t compatible. 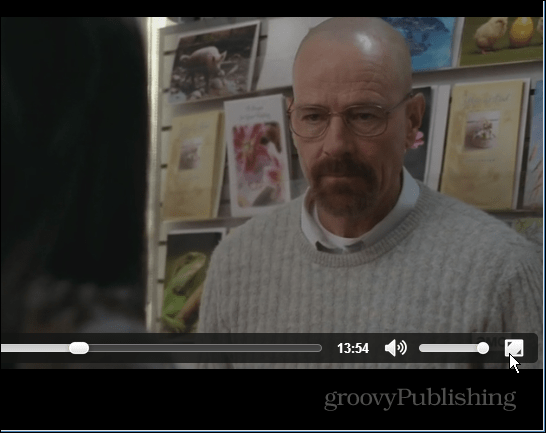 It plays pdf.,mp3’s and mp4’s great but avi…no…mkv…no..divx…no is there an extension for Chrome I’m missing or what? This thing is cool and easy and when it works it’s great but man does not live on one format alone. I don’t get a visual when I play some mp4s, only audio. i know a software called idealshare vdieogo which can easily helps me to convert all kinds video like mkv, avi, mp4, mov, flv and etc to chromecast supported format. I’ve been using the Chromecast for a few months, just took advantage of the built-in Hulu plus and Google play music trials and have used various apps on my Moto X to stream all of my viewing and music content (I haven’t used a TV tuner or cable box in well over a year). My Windows computer is unavailable, so I have my Moto X and 7″ Kindle Fire HD (2013). I was about to give in and buy the EZ Cast competing product since it has a faster GPU, more RAM, and support for many formats, costing around $40. I thought I’d make an effort to research possible workarounds or a hope to see news that the unsupported formats might be uploaded in an update. This is the first page I have visited in my endeavor, but it has already offered good enough suggestions to sway me from spending money on thhe better alternative product… for now. Since my Windows system is down, I may have more of a challenge with just a Kit Kat device and Kindle (aside from my Linux system). I didn’t offer any valuable information, but I’m a 25+ year HW/SW QA testing computer professional, and hopefully my decision to keep my money for now may help others decide what might work best for their situation based on others’ experiences. Happy Casting – kick the Cable and Satellite habits and go Hulu plus and Torrenting (try Popcorn Time aka Time for Popcorn) so you don’t spend your hard earned money needlessly. i can drag and drop only one of my files. the others show as a down load in the bottom right corner then open up in a default browser not in chrome… what am i doing wrong? It worked but no subtitle!!!! can you help me about that? Thanks for this, I have wanted to know if I could Cast my downloaded films to the TV for a while. It works, but the films are often very “robotic”, that is, they don’t “flow”. You know what I mean. How can I stream a MP3 playlist? This thing landed under our Christmas tree a year ago (2014). I would rather Santa left a bag of coal. Lastly, all of it gets tangled up in a mess of video wrappers: MP4, MKV, AVI, M4V… It’s exausting and the only type that works well is MP4! That’s when a freeware universal app called Handbrake. It’s a transcoder that’s fairly simple to use, if you have the patience to wait for Handbrake to finish. Here’s a helpful hint:: Handbrake will transcode just about anything, but it will always default to an M4V format. Videostream and Chromcast App doesn’t play that. So, under Handbrake’s “File – Preferences, look for “Use Ipod/Iphone friendly (.m4v) file extension…” and uncheck it. That will solve that and all resulting videos will be playable with Videostream. Thanks a lot for this. It actually works now with flac as well. But the 700+-100 kBit – stream of the flac file seems to be transformed into a 100 kBit – stream of unknown sort, probably re-mp3-ed, which is sort of a pity. You can even use the google chrome as file manager and go up and down your music library directory structure. thanks. I needed a refresher! like a charm – mp4v & mp4 voila!!! Google Cast extension has been discontinued!